Maine Chihuahua Rescue View other Chihuahuas for adoption. Sandy was saved from one of the shelters we work with in Texas. She is spayed, rabies, core vaccines, de-wormed, heart-worm and tick-disease tested; Negative and micro-chipped. She has an estimated date of birth of 13 June 2016 and has an estimated weight of 10 pounds. Star has been listed as a Chihuahua. We have no way of knowing the true breed, it is up to you to decide what you think her breed/s is. 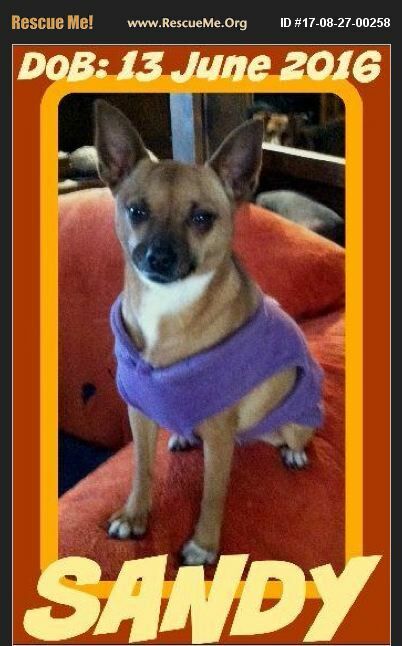 �'��Sandy is a sweet girl, she is very quiet and gentle although is gaining confidence here at the rescue and getting. She does act like she has been abused, if you go to pick her up she screams and curls into a ball, but once you have hold of her and reassure her she is good. Once she feels confident she really warms up and enjoys cuddles, ear scratches and belly rubs. She would love to sit on someone's lap on a nice comfy chair or couch and get all the love that she has missed over the years. �'��Sandy is located in the kennel building and does use the dog door to go in and out to do her business. There have not been any accidents in the kennel and no damage to anything. �'��Sandy is fine with the other dogs, being around big dogs doesn't bother her she is quite confident being amongst a lot of dog, but she isn't the dog that wants to run, wrestle and play with them all. She is definitely more a lap/human dog. �'��We do not recommend dog parks for several weeks, if not months, it is so very important for families and dogs to form a strong bond and get to know each other before exposing them to the potential dangers of dog parks. Although all GaDaH dogs are very well socialized with other dogs, lots of other dogs have not had the benefit of this socialization and do not always know how to play and act with other dogs. You also do not know the control the other families have over their dogs and you should always have a good recall for your adopted dog before going to dog parks. Sandy is going to need a family that is used to small dogs. Someone who understand that she will need training and guidance and learns that humans are in charge so that she doesn't get too much of a handful. A somewhat active family who can give her the lifestyle that she needs. Going on road trips, to new places, hikes and adventures and letting her explore the sights, smells and sounds the world has to offer will be to hers and your benefit. It is important that her family understands the importance of basic and advanced training. We advise that families work on their own basic training so that boundaries and expectations can be set and personalities and body language learnt in the process, which will help form a much stronger bond. Sandy will make a great family addition to an experienced family. She is fun, loves the outdoors and very loving and deserves a good family and home to call her own. Sandy is available for adoption from Give a Dog a Home, German Shepherd Dog Rescue for an adoption fee of $500. This fee is not negotiable and is used to cover the rescue costs of pulling, vetting, health certificate, transport from Texas to Maine, monthly preventatives, supplements, food and anything else that is needed. If you feel that you have the heart and home to give this precious soul a wonderful life, please go to our website, under the APPLICATION tab, complete, then submit the APPLICATION. Our process takes around 2-4 days, and ensuring your references are aware that we will be calling, could speed up the process. Once you have been approved, we discuss any questions in regards to the dog you are wanting to adopt, then you complete and submit the contract, make payment and then we can work out the pick up / transport arrangements. Please do NOT submit an application if you are not looking to take home a new best friend within the next few weeks. http://www.giveadogahome-sanantonio.org Sandy is located at the rescue in Sebec, Maine. We post in various states along the east coast and Canada where we have had lots of successful adoptions to enable more exposure for these beautiful saved souls. Families will need to be prepared to travel to the rescue to meet and take home their new best friend. Sebec is located just outside the towns of Dover-Foxcroft and Milo (approx 8 miles) and approx 45 miles from Bangor. There are also lots of hotels, motels, pet friendly accommodations and wonderful camp-sites for the more adventurous families and what a great way to get to know your new best friend. If there are options to arrange transport, we will work with you to make it happen.